Skin discolorations and growths such as moles are commonplace for many people. For some, however, moles pose not just a physical disadvantage, but also a health risk. Moles often show up during early childhood or adolescence and are typically harmless. Usually, they appear as a cluster of cells that look brown or black, sometimes raised in appearance. While many moles are harmless, some moles may be an indication of skin cancer. A developing mole, or one that has existed since childhood, is often considered to be a normal anomaly on the skin. Most patients often disregard these. However, the development of new moles may be a sign of skin cancer or some other serious medical condition. As a result, it’s important to allow the medical professionals at Addison Internal Medicine to inspect and treat any moles you find. Your mole grows in size. You experience pain associated with your mole. You develop more moles on your body or near an existing mole. Your notice abnormal hair growth near a mole. At Addison Internal Medicine, mole removal is performed in our clinic. 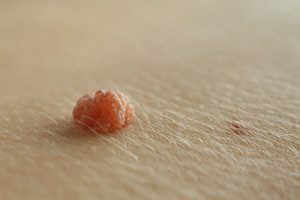 All skin growths that are removed are sent for biopsy to ensure that each patient receives the most accurate information about potential skin conditions. If something other than a benign mole is found, our team of internal medicine specialists will provide expert analysis to assist patients with finding the safest course of treatment. Schedule your appointment for mole removal with Addison Internal Medicine by contacting us online or by calling 972-733-3090.